We loved all aspects of this hotel and will definitely be back! Hotel Indigo was an absolute stand out. We loved the whole hotel, especially the generous tropical outdoor spaces and unique dining areas. It feels like a quiet haven away from the busyness of Seminyak. The beach front location is beautiful and very convenient. The staff were exceptional and were actually one of the highlights of our stay. They were all so genuine and friendly with the most outstanding service. We cannot wait to come and stay again! Hotel Indigo was a luxurious place to stay.Rooms were neat ,tidy spacious and serviced every morning and beds turned down at night. Nothing was problem for the lovely friendly staff. they can arrange your whole holiday for you.The meals were very good and more than enough for us but dinner at Salon Bali is a must..Close to shopping and restaurants and the beach only a few steps away.Coctails and a beer on the beach at sunset was amazing.Everyone should experience this hotel and its wonderful staff and great facilities. Excellent facilities and the staff were very friendly and helpful. Great location right on the beach. Would definitely stay again, beautiful new hotel, fabulous modern Indonesian design. Friendly staff on all levels from gardeners to front of house. Occupancy was about 60% when we were there, not sure how staff would cope when hotel is full, but I am told they are going to increase staff levels. We thoroughly enjoyed our stay, the hotel is very luxurious and the fit out is eclectic, character filled and stylish and very different to other resorts we've visited. The bed was very comfortable and the air conditioning and fan very good. The pools and gardens are stunning and it is right on the beach front. We found the service to be very good and very friendly. The manager Terry made time to meet and talk with us and as we had a delay getting a coffee made he gave us a complimentary high tea for 2 and we also received a complimentary bottle of sparkling wine which was lovely. The coffee is excellent and they have a special cafe where they grind and make the coffee. The food was lovely with options for non-Indonesian food. Currently they are finishing 2 additional bars/restaurants which will be a great addition to this lovely hotel. We found the food and drinks to be very reasonably priced considering the level of luxury at this hotel. The hotel is located right on the beach next to other lovely hotels and restaurants where you can watch the sunset. There are plenty of cafes and shops within walking distance of the hotel however staff can easily arrange a taxi or car which are also very reasonably priced. Can highly recommend this hotel. My husband and I discussed the night before we left Hotel Indigo Bali how the hotel could have improved our stay or others'. This was our first time to Bali as we've always been hesitant to go for a number of concerns...however we are already talking about revisiting. We love 5 star hotels and everything that go with them. 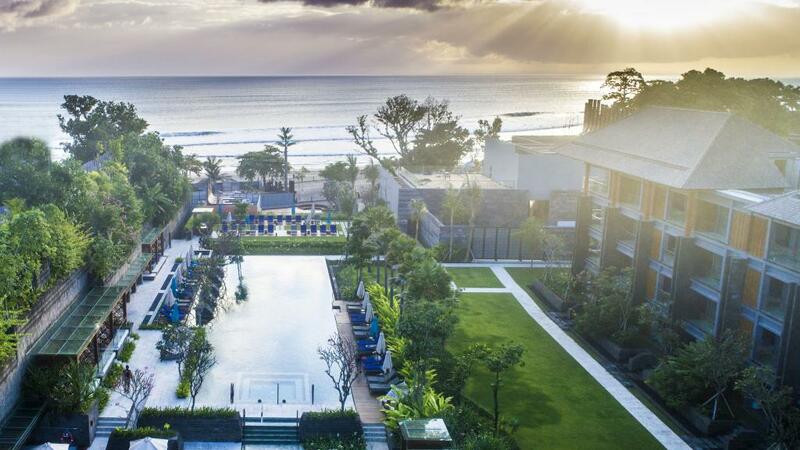 We stayed at Hotel Indigo Bali for 7 nights and it did not disappoint. We loved the quirky, hipster style rooms, the breakfasts, the pools, the spa, most importantly the staff. Friendly, happy, attentive staff, every question, every query dealt with efficiency and a smile. Clearly the hotel has a terrific staff culture. With the hotel just opposite Seminyak beach, we were able to walk along the sand every morning and have a dip before heading back for an incredible breakfast with many cultural options. Hubby and I discussed the staff were perhaps a little over attentive inside and under attentive poolside but this is NOT a negative just merely an observation where speaking other languages may come into play. For other travellers reading this review we are a couple in our 50's..but there were many other age dynamics, families and singles all WELL catered for. We loved our stay at Hotel Indigo and will return without doubt. A lovely resort with beautiful decor. Rooms are spacious with many extras that you may not see in other resorts of the same calibre. Staff are very pleasant. Always cheery and willing to assist with any of your needs.